David Nicholls manages to give his books personalities, and Starter for Ten is certainly exemplary of that. Firstly, the book is hilarious! I think I laughed out loud at least once in every chapter (picture me sitting in a café chuckling on cue every 10 minutes). The most compelling aspect of the novel for me however, was the way in which Nicholls provides a documentary about being a student in 1980s Britain. He uses popular music, fashion, food, and celebrities to give the novel a distinct place in time, which makes for an educational experience. The novel is written for modern young adults, and whilst Brian is a student in a completely different cultural context there is no doubt they are still able to cohere and empathize with the embarrassing skin problems (more than anything else) and relationship traumas Brian endures. The novel is all at once relatable yet historic. Back to the point about Nicholls giving his books personalities, if this book was a person it would be an agony aunt! It deals with anxieties students are bound to face like rejection, embarrassment, fear of failure etc. and the constant humor really does dilute them. Brian is SO awkward that It’s reassuring. No matter how socially inapt you may think you are, or how embarrassing you believe people think you are, it’s okay, you are not as awkward as Brian! Okay, we all trip over our words when trying to impress someone or when socializing with a new crowd but after a while we’re fine, Brian never quite gets there. For example, He instantly harbors a huge ‘crush’ for Alice who is evidently miles out of his league, and at first it is endearing that he communicates with her through very simple dialogue, of course he does, he’s nervous. However, he seems to never really get past this nervous stage, endearing quickly becomes pitiful. Brian does get a cathartic ending, he gets a girlfriend similar to himself, he becomes less anxious, but he also describes himself as “a lot wiser” (469) yet he is only nineteen. Personally, my pity for Brian was confirmed in this line, perhaps at nineteen you are a little wiser about life and relationships, but a lot? I can identify with the feeling of finishing a year at university and feeling more learned and far more resilient, but not omnipotent that ‘wisdom’ would suggest. I suppose to me, this ‘wisdom’ Brian may be referring to is actually more of a loss of naivety, and of acquiring a certain savvy streak in your personality. The heavy dialogue signature to Nicholls style makes for an addictive read. The book can easily be read (and re-read in my case) in a day. I would recommend Starter for Ten, or any of Nicholls novels for readers looking for a light-hearted, funny and warm experience. Written from Brian’s first person perspective, it is also the perfect read for anyone interested in the drama of a book, and the nature of relationships. It may seem odd for me to say you should read it if you’re interested in storyline or drama, for what else do we read for? To me reading isn’t always for the storyline alone. Some books we read as research to collect a list of different style and techniques of creating drama, or we persevere through books we quickly decide aren’t for us to eliminate storytelling techniques from our own style. 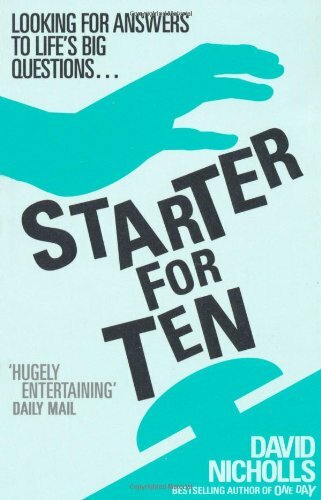 Starter for Ten for me was a luxurious read for those times when we have a free afternoon, or even a holiday read we can indulge our attention in completely, and for anyone that enjoys watching drama on stage or on television this book is an ideal alternative.